Please refer to our stock # 11536 when inquiring. This unusual vintage bakelite bracelet is 7/8" wide and has a 2 1/2" diameter opening. 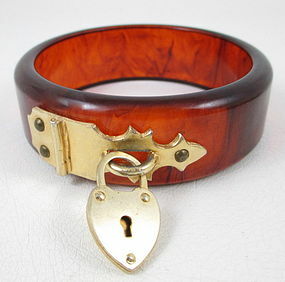 It is made from tortoise shell colored bakelite and has a decorative hasp with dangling heart shaped padlock. It has some light wear to the gold tone finish, but overall, the bracelet is in very good condition.